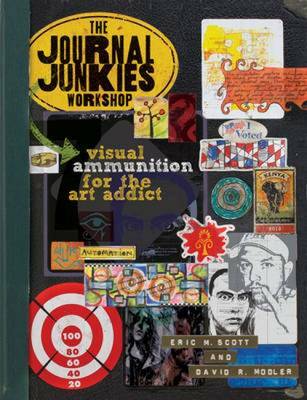 YOUR MISSION: Discover the tactical secret of self expression--the art journal! Harness the artistic explosion ticking in your head, just looking for a creative way to detonate. Prepare to be bombarded with ideas, techniques and suggestions as you allow your creativity to take hold. The Journal Fodder Junkies are on a mission, ready to arm you with all that you need to explore artistic ways of recording your life and thoughts. Part sketchbook, part diary, part notebook, part dream journal, part daily planner, part to-do list and part doodle pad, the art journal is different things to different people. Whatever it is for you, the Journal Junkies Workshop contains all the covert inspiration and know-how you'll need to get started. Uncover your own path, your own voice, your own style. Inside you'll find: * Basic information on the supplies and materials you'll need to start your journal experience. * Step-by-step presentation of techniques using water colors, acrylic paint, image transfers and more. * Chapter-by-chapter demonstration that follows the Junkies' techniques as they layer a page, taking it from blank canvas to dynamic document. * Ideas on how to get started writing in your journal, covering both what to write and inventive ways of writing it. * Gallery spreads taken straight from the authors' journals that give you a unique opportunity to peer inside the heads of two experienced art journalists. Grab a journal and begin basic training today with Eric Scott and David Modler to become a Journal Fodder Junkie!